There is a deep fracture in the global talent supply chain. In 2013, countries from the US to Canada, Australia and nations in Europe, were reporting their inability to fill skilled trades as their top problem. Globally , the skills category had topped the rankings for six of seven years till 2014 as being the most difficult to fill. Nasscom in India says only 25% of graduates working in information technology are readily employable and the India outsourcing industry is already spending more than $1 billion a year on readying these graduates for work. Where can world leaders find a solution for a skilling system for entry-level mid-skills jobs that can produce a turnaround at scale and do so expeditiously? This is a question that hounds policy planners. The emerging scenario in India tells us how important it is to find the right answers -because by 2020, 60% of India’s population of 1.3 billion will be in the working age group of 15-59 years. Even existing industry-linked vocational training programmes like the ones in Germany and South Korea that have shown success are limited by the scale they can be deployed on. In addition, market conditions demand a revamp of the old models because: Industry needs have become increasingly dynamic, calling for an on-demand update of training programmes and associated teacher training and distribution Job competencies are getting globalised, calling for global skilling standards Better focus is required towards entry level mid-skill jobs where demand is significant Systems that use affordable open source and cloud technologies are providing the necessary scale. In this model, textbooks are replaced by cheap, digital cloud-based immersive and engaging multimedia content. The content can be in the form of videos, animation, gaming and can be self-paced and needbased, freeing up time for family obligations, part-time jobs and other pursuits. We have seen some successful cloud-based models such as the Massive Open Online Courses (MOOCs). An example is of the Khan Academy for high school math and science education. But the need is for a blended model that goes a step ahead. This model combines classrooms with online learning.Skills Development Network for mid-skilled workers created by the Wadhwani Foundations follows this model which falls neatly between the MOOCs platform and a traditional classroom. Skills Development Network has been piloted in India using ex isting infrastructure at over 1000 Indian high schools and post-secondary institutes, and in Community Colleges in the US. The programmes are a result of collaboration with industry and academia experts such as the Bangalore-based Narayana Health and Healthcare Consortium for nursing and patient care, the Zuri Hotels for hospitality, Café Coffee Day for retail café operations, Dusters Total Solutions Services for facility management, Anne Arundel Community College for Cybersecurity and Borough of Manhattan Community College for Medical Assistant Specialist curriculum. Importantly, this model blends online and classroom instruction. Using cloud technology, mobile networks, video and open source, courses and training can be distributed at will, in practically any language and geography.The content can be changed on demand without loss of standards or relevance. There is substantial proof the model works. At the Narayana Health and Healthcare Consortium the programme has reached 5,000 nurses and assistants across 20 centres in the past year. Narayana Health has plans to expand from its existing 5,000 beds to 30,000 beds in the next two years. It has chosen the technology-backed, blended, learner-centric model over its traditional teacher-driven courses to scale and ensure standards for care quality are maintained. 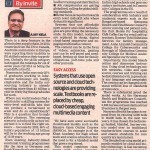 The blended learning model primarily enabled by cloud and mobile technology is fast becoming the foundation for a low-cost solution to address the skills gap.With demonstrated success in two extreme markets -India and the US -it could stand the litmus test of practically any socioeconomic context.